← Market Timing Brief for the SP500 Index Close on 2-14-2014: Post Valentine Kiss of the Top? There is a new Bull market in gold and silver. 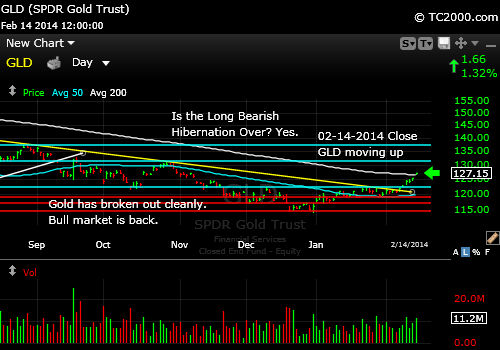 We made the exact progress hoped for in last week’s report, with GLD now above the lowest aqua resistance line. The rally is finally on for the gold bugs. (I mentioned on Twitter why I bought silver (SLV) instead of gold at lower levels. There was a lag at first, but silver started catching up at the end of the week as Tweeted.) The main headwind for gold will be interest rates (TNX, TLT, TBT) and the value of the US dollar, which are intertwined. If rates move over the immediate overhead resistance line (green line in the 2nd chart below), gold will be under pressure. Gold breakout is strong for now. 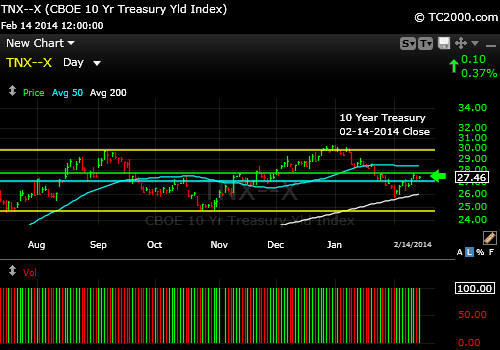 Rates are off their lows and hesitating at resistance. This entry was posted in Bonds, gold, investment, metals, Treasuries and tagged 10 year treasury, gld, gold etf, market timing, tbt, tlt, tnx. Bookmark the permalink.